This week sees the twentieth anniversary of the release of the Disney classic, Pocahontas. The world has changed considerably in those two decades, but the underlying issues and problems with the film remain very contemporary. The movie evokes poignant memories for me. I never saw it in the cinema, but watched it countless times on VHS with my then toddler son, in a remote cottage in the middle of a Scottish moor. Pocahontas was not the most successful of the major Disney releases of that era. It has been largely eclipsed by the giants of The Lion King, Aladdin, and Toy Story. But it is one of the few Disney animated classics that attempted to portray a ‘real life’ story. Disney’s telling of the Pocahontas story was an interesting blend of actual and imagined history — tending much more towards the latter in many respects. We do not expect a Disney cartoon to tell us how it is. But what they do say — and how they say it — is of great significance. Even after all this time, I do not know quite whether I feel comfortable with the film. The storyline for the female lead (the ‘Indian princess’ Pocahontas) was quite distinct in its time, predating Elsa and others in its portrayal of a young women choosing to defy the expectations of the men around her. However, she does rather instantly ‘fall in love’ with the first tall blond European (with Mel Gibson’s voice) that she meets. The problem with the film was not so much how historically accurate it was, but rather how it dealt with that most fundamental of encounters in American history: the apparent first encounters between the English settlers and the native people. The tale of Captain John Smith, Pocahontas, and the Jamestown settlement in 1607 was not the first English/British encounter with America. A colony had previously been attempted twenty years before on Roanoke Island, around 150 miles to the south (in what is now coastal North Carolina). And of course the Spanish had been settling in the New World for over a century, including on the Florida mainland since 1513. In addition a group of French Huguenots had unsuccessfully attempted to create a settlement in Florida in the 1560s (who failed due to starvation and a Spanish massacre). The Jamestown settlement was distinct for the English, inasmuch as it was their first successful colony in America. It was successful largely due to the support given to the settlers by the native people, as had happened previously on Roanoke Island, despite various tensions. The English settlers would have all starved to death without the food supplies they traded from the Powhatan nation. All this predated the native help associated with Thanksgiving, which is usually tied to the New England Plymouth settlement in 1621. In fact, the long-term success of Jamestown was due to the successful cultivation of tobacco from the West Indies, which became a lucrative cash crop for supplying this new habit in England and the continent. 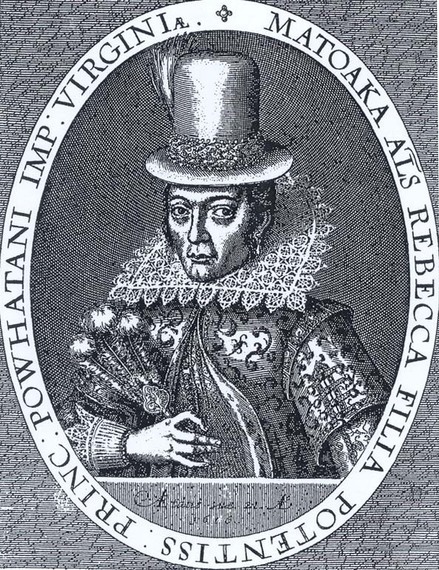 And so, Pocahontas (later known as Rebecca, and also as Matoaka or Matowa among her Powhatan people) was not the first native American to make contact with the English, and most probably she was not the first native American to either become a Christian or to enter a relationship with an English settler. She did not marry John Smith, despite popular imagery of her relationship with him. And she was probably only around ten years old when the English arrived. But she did later marry another English settler, John Rolfe (the man who developed tobacco in Jamestown). Matoaka travelled to England with Rolfe in 1616, where she met King James and Queen Anne, before her sudden death as she prepared to return home. Matoaka is one of the few named native women in early American history, and in this respect a film representing her did bring to life many of the awkward contradictions of the foundation of British America. In fact, the film dramatised some of these issues, giving some voice (despite it being Disney) to criticisms of the greed that motivated the settlement, the destruction of the environment by the settlers, their prejudices towards the native people, together with the conflicts that arose between them. However, being Disney, the film did not attempt any significant historical revisioning, and instead rendered the negatives of colonisation as personal rather than political. In short, the film Pocahontas managed to airbrush over the British settlers’ genocide against and land seizure from the native American people, in the interests of a personal narrative of self discovery and mutual love. Of course, it was not the first such dramatic fiction of the European encounter with the New World to do this, and it wasn’t the last. Ten years after the release of Pocahontas, the tale was told again by Terrence Malick, in the epic film The New World (2005), starring Colin Farrell (as John Smith), Q’orianka Kilcher (Matoaka), and Christian Bale (John Rolfe). Although spectacularly visual (and indeed filmed in the original areas around Jamestown), this later film was narratively challenging, and for me at least proved too much of a chew beyond its initial stunning opening scenes. Now twenty years after Disney’s Pocahontas, the challenge should be to find new ways of retelling this old story. These should not simply pander to the insatiable interest in that initial period, when the seemingly docile land of ‘Virginia’ offered the English (and other Europeans) wonderful prospects for expansion and economic development. It also has to come to terms with the countries and the people that were trampled upon and plundered in this colonisation of the New World. This requires us to go far beyond the trivia of idealistic Pocahontas portrayals and blatantly racist survivals in names such as the Washington ‘Redskins’. ‘We live in a society that suffers from historical amnesia, and we find it very difficult to preserve the memory of those who have resisted and struggled over time for the ideas of freedom, democracy and equality. America has always been both deeply xenophobic and a land of relative opportunity. ‘White interest in the American Indian surges and ebbs with the tides of United States history…, forever linking Indians with the untamed forests, fields and streams. In short, the tale of Pocahontas — that is of the woman Matoaka and the convert Rebecca — is not a love story, it is a tragedy of epic proportions. Not only of a young woman who died at the age of 21 with an infant son, the tragedy is what happened in the ensuing centuries. For the First Nations of America, there was no Disney-style happy ending.